In one of the more interesting bills signed into law by Gov. Jindal, Louisiana now bans the sale of dogs and cats from certain public areas, replicating what many parishes have already banned on a local basis. Animal activists have long been angered over individuals selling dogs and cats in shopping center parking lots or along the roadside. This bill makes it a misdemeanor, with the first offense punishable with a $250 fine and up to $1000 for a second offense. The law is narrowly written and states that specifically dogs and cats cannot be sold “on any highway, right-of-way, flea market, public park, playground, swimming pool or any other public recreation area or adjacent property to such location regardless of whether or not access to those locations is authorized, or on any commercial or retail parking lot unless permission is granted by the owner of the lot”. The law specifically excludes “bona-fide humane societies, animal welfare organizations, local animal control activities or any non-profit organization sponsoring an animal adoption event”. It will also not apply to pet stores or licensed breeders of animals or animals sold from a private residence or from a dog or cat show. 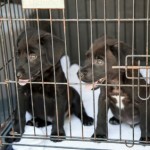 Animal activists, pet retailers, and breeders object to this type of animal sale because there are so many adoptable animals already in shelters. By purchasing animals from these unlicensed vendors another abandoned animal in a shelter will likely perish. In addition, pet stores and licensed breeders object because are subject to local and state laws, are required to pay taxes and license fees, and are subject to inspections, expenses and conditions that roadside and parking lot vendors do not have. All in all this is a good law that should help take reduce the unlicensed sale of dogs and cats from the roadsides and parking lots and hopefully more people will visit their local animal shelters or pet adoption centers to obtain healthy dogs and cats.